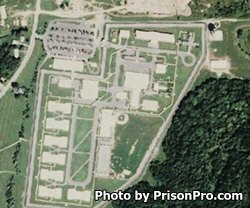 Cayuga Correctional Facility is located in Moravia New York. It is a medium security prison that houses adult males. The current capacity of Cayuga Correctional Facility is 1,082 inmates. The prison consists of several general population units, a special housing unit, and S-Block unit. While incarcerated here inmates can take adult basic education courses and earn a GED. Cayuga Correctional Facility offers inmates vocational training in electrical, masonry, horticulture, business, flooring, building and custodial maintenance, and painting. Offenders can also receive alcohol and substance abuse treatment and participate in Alcoholics Anonymous group sessions. Visiting for general population inmates and SHU inmates is from 8:30am-3:30pm on Saturdays, Sundays, and Holidays. Processing of visitors stops at 2:30pm, you must arrive prior to this time if you want to attend a visiting session. S-Block inmates have visitation on Saturdays only from 5:30pm-9:30pm, processing of visitors ceases at 8:30pm. Up to three adults and three small children/infants (children must be able to be seated on your lap) are allowed per visiting session.